I hope you'll consider exploring the Black Hills and Badlands. 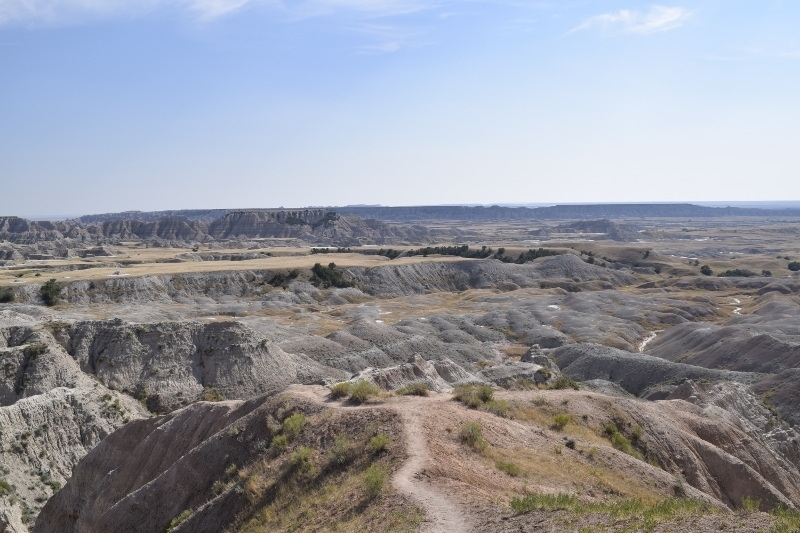 Recently we had the good fortune to return to Badlands National Park and the Black Hills area. As those of you who have followed my blog for awhile know, I love these places. 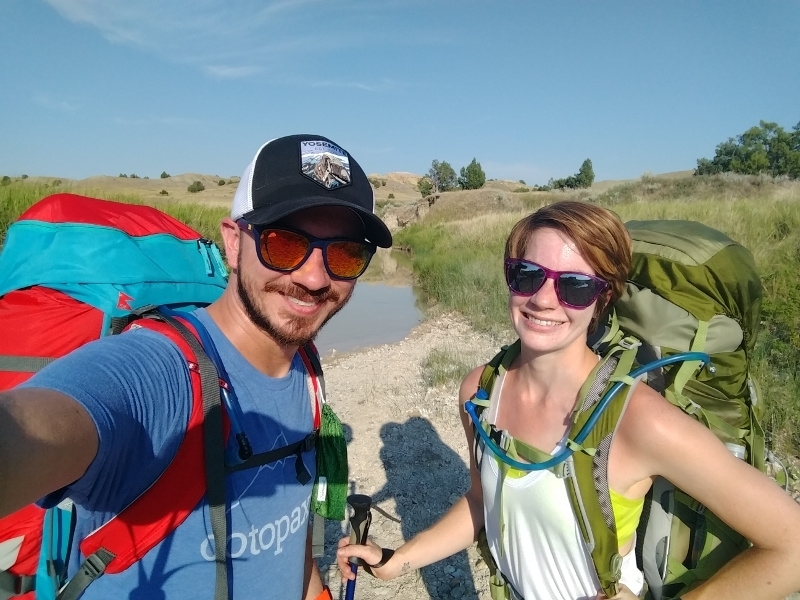 So when we had the opportunity to partner with Black Hills and Badlands to explore some new places and experiences in western South Dakota, we jumped all over it! Badlands National Park is expansive, otherworldly, and expansive. This is my third trip to the area, my first being our honeymoon in 2015. With each successive visit, I grow more enamored with it. Since we’re always coming from the east, Badlands National Park is our first stop, and this trip was no different. On that first trip, we stuck mostly to the overlooks on Badlands Loop Road. Last year on our road trip, we spent more time outside the car. 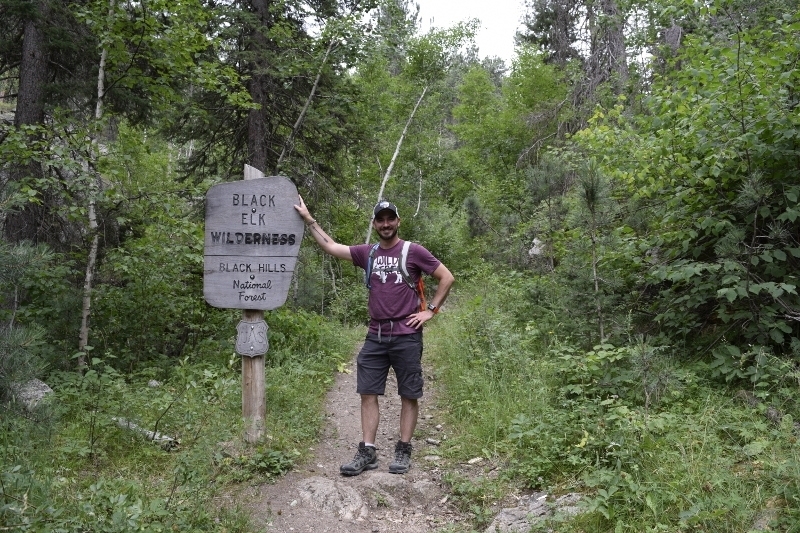 We hiked Notch Trail and Saddle Pass, and then stayed at the primitive Sage Creek campground. This year we wanted a whole new Badlands Experience, so we decided we would camp in the backcountry. 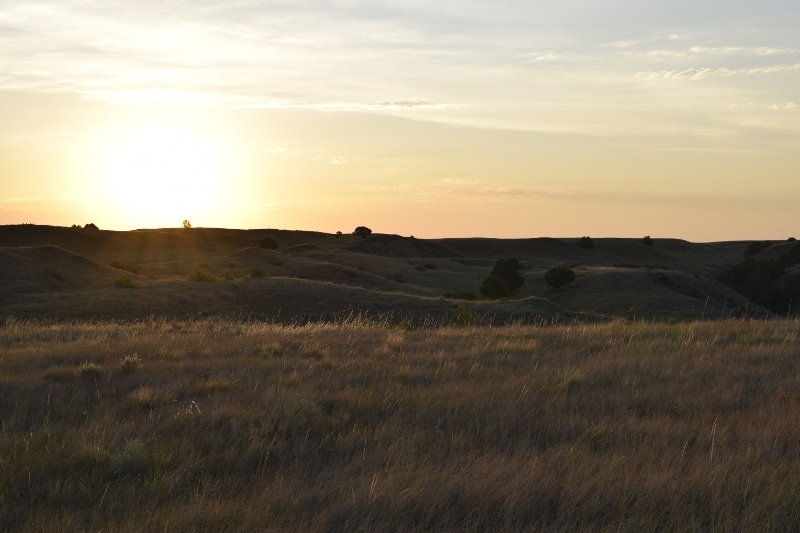 Unlike other National Parks we’ve camped in, you don’t need a permit to backcountry camp in Badlands National Park. 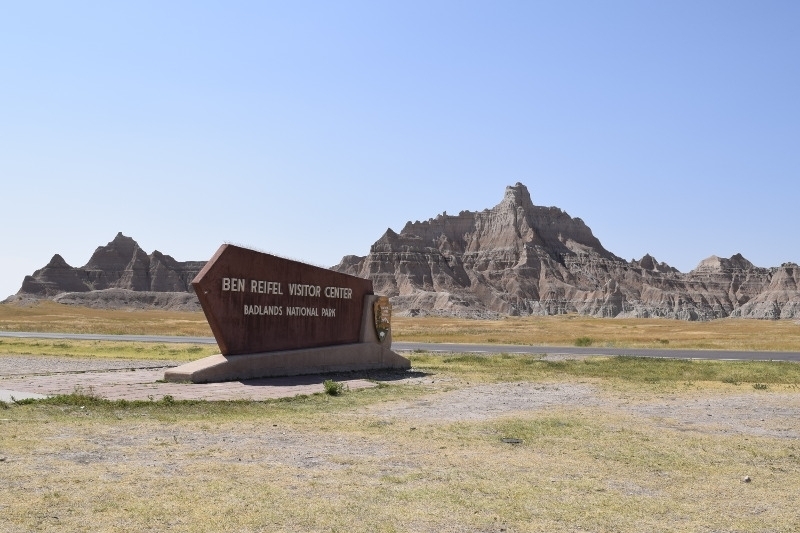 It is highly advised that you check in with a ranger at the Ben Reifel Visitor Center before you head out, which we did. The ranger will notify you of any hazards or safety concerns, and it’s just good practice to let them know where you intend to be. Stop by the Ben Reifel Visitor Center and have a chat with a ranger before you head into the backcountry. 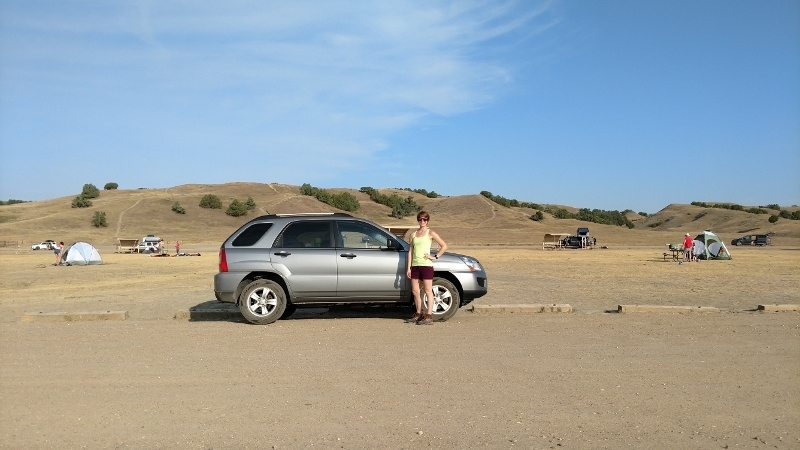 We parked the Sportage at Sage Creek campground, a mere stone’s throw from where we slept last year. Instead of setting up a tent, however, we pulled on our backpacks, signed the trail register, and began walking south. Heading south into the backcountry on a rough trail following Sage Creek. Meandering along unofficial trails following Sage Creek, we felt no need to rush. We had plenty of time, plenty of water, and plenty of freedom to explore. Such freedom and abundance provide all the motivation I need to walk out into the wild when I have the opportunity. Not only do find peace in the solitude, but I never know exactly what I’ll find around the next bend. This bull bison stood directly in our path, but we figured he had the right-of-way. In this instance, we found a large bison blocking our path. It’s important to exercise caution around them; they seem tame and docile, but are most assuredly wild. They can be dangerous, and a charge from one of these guys has the potential for disaster. We gave him a lot of space, arcing wide as we continued on, giving him plenty of leeway. He lives there, we were merely visiting. Moving past him, we decided to seek out a campsite on slightly higher ground. After a bit of searching, we found a nice spot that would make a good home for the night. Only then did we discover that our large bison friend was only the tip of the iceberg; looking out we saw hundreds of bison in the distance. Luckily the herd slowly made it’s way westerly, shrinking from our view until we could no longer see them at all. Look at all those bison! We ate Mountain House backpacking meals and watched the sun sinking below the horizon. The temperature instantly dropped a few more degrees when the sun fell below the ridgeline in the distance. When we set out from the car, we sweated in the 100+ degree heat, but shivered in the sixty degree night. We pulled on hoodies to get comfy, and laid back, watching as stars slowly emerged in the sky. The sun setting beyond out campsite. Fires are never permitted in Badlands National Forest, not even in the designated site, and most definitely not in the backcountry. Drought-like conditions during our visit heightened this danger, and we exercised an almost paranoid caution while lighting my backpacking stove. Of course, we experienced no issues, but I mention the prohibition on campfires for two reasons. Firstly to remind you to exercise caution with fire, and to never light one when you visit the Badlands. 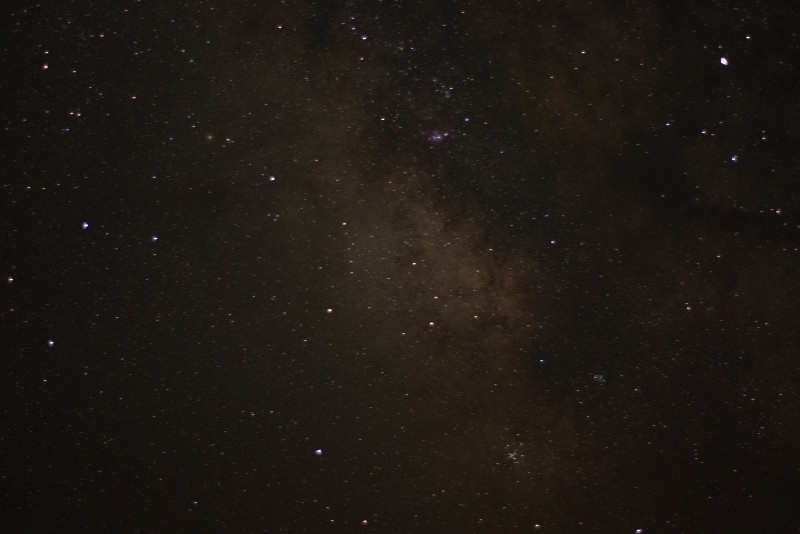 Secondly, to let you know that aside from camper’s lights in the distance at Sage Creek campground, we experienced no light pollution at our site. With barely a sliver of moon visible, the stars popped, and the milky way splashed across the screen, like a Jackson Pollock had the artist painted with light. I set up the camera and tripod, adjusted my settings, and got to work on my first ever experimentation with astrophotography. Though I have a lot of learning left to do, I think I’m off to a decent start. I still have a lot of learning to do, both while taking the shots and while editing them, but I’m enjoying the process! Eventually we settled into our sleeping bags for the night, still gazing at stars through the mesh ceiling of our backpacking tent. A fresh breeze blew through the tent, and we quickly fell into deep slumber. We awoke to warm light. The sun had not yet risen over the horizon, but a pleasant glow had already illuminated as far as the eye could see. We sipped coffee as we watched the sunrise, as a bison lazily munched grass nearby. The sunrise was even better than the sunset! We packed up our gear and began the hike back to the Sportage. Hiking in the morning proved much more temperate. With the sun low in the sky, the heat was mild, and we made short work of the return trip. 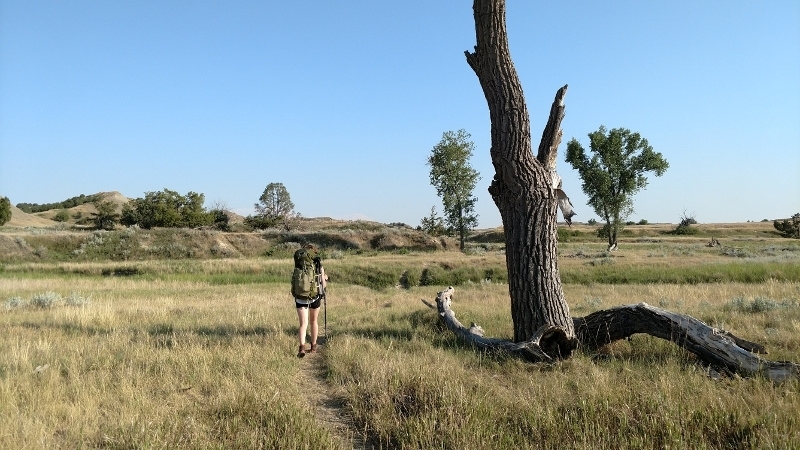 Morning is probably the most comfortable time for hiking in the Badlands, especially in the summer months. There are a few important things to remember about backpacking in the Badlands. First of all, you’ll find no potable water in the backcountry, so you must carry all the water that you’ll need. Make sure you take plenty, because you’re going to sweat, especially in the summer. Second, you need to carry out all your trash, including toilet paper. Adhere to leave no trace principles while you’re out in the wild. 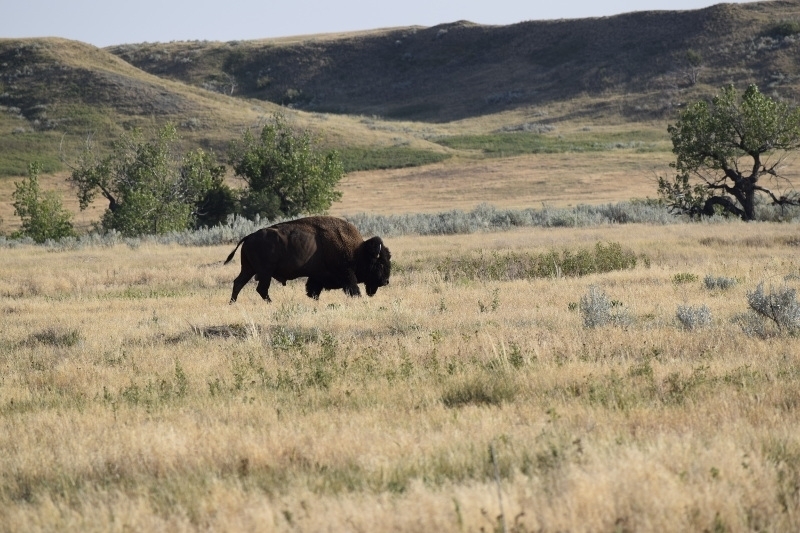 Third, exercise caution around the bison; they seem docile but can become aggressive. Keep plenty of space between you and them. Lastly, make sure that someone knows where you’re headed and when you’ll be back. That’s just good practice no matter whatyou’re doing. I have to sing the praises of our Sportage; though we put her through a lot, she’s never let us down! After loading our packs into the Sportage, we climbed in, and hit the road again. We had enjoyed our time in the Badlands, but our trip wasn’t over. We continued westward, and the dry grasslands transformed into the rolling mountain range covered in ponderosa pine. Hello Black Hills, I’m happy to see you again! I’ve visited and written about the Black Hills a few times now, but I haven’t grown bored with this place. Far from it, actually. There’s an incredible amount of things to do here. Attractions like Mount Rushmore or the Sturgis Motorcycle Rally might be tourist draws, but the area’s public land and related outdoor recreation opportunities are what makes the region special. You can’t drive anywhere around here without passing a trailhead, a campsite, a state park, overlook, or picnic area. The fact that more people don’t consider this whole area a major outdoor destination boggles my mind. The Black Hills National Forest; I love it here! We set up camp at the Horsethief Lake Campground, which is a nice National Forest designated campsite. You won’t find solitude here, but you won’t feel like other campers are right on top of you either. Some of the tent spots are right on the lake, which is beautiful, and you’ll find a small trail that almost encircles the lake. This will lead you to the day use area parking lot where you can access the Horsethief Lake Trail trailhead, but I have to confess, we had a little trouble finding the trail. 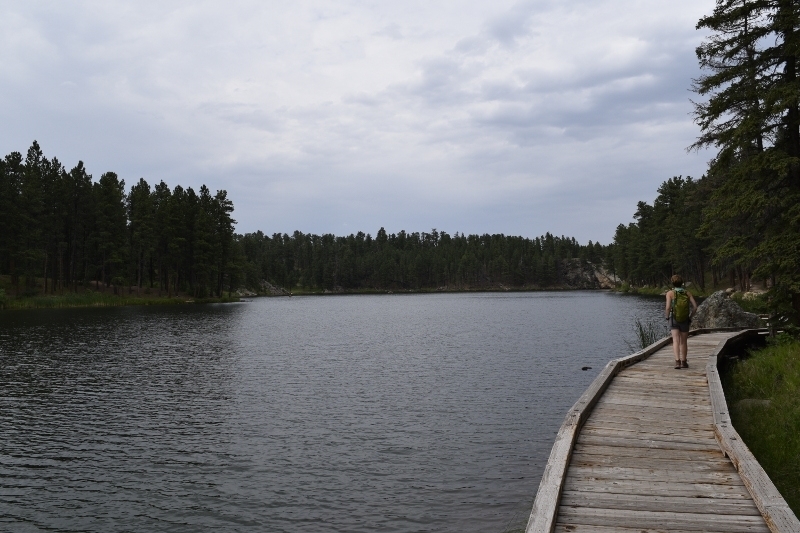 Though we enjoyed walking around Horsethief Lake while we looked. After a little walking, talking with fellow hikers, and a little more walking, we finally found the trailhead. As it turns out, it’s closer to the road than the parking lot; if you walk in from the campsite, you wouldn’t think to head that way and if you drive into the parking area, you won’t even notice it. Either way, walk back up the drive toward so walk back up the entrance road towards State Highway 244, and you’ll find it. Not far into the hike you’ll enter the Black Elk Wilderness. You’ll need to fill out a wilderness visitor permit, even if you’re just day-hiking. You only need one per group, and the permit is free, so make sure that you stop at the self-registration box, fill out the permit and carry a copy with you. Welcome to the Black Elk Wilderness. Make sure you fill out a permit at the self issue registration box. Roughly a mile in, Horsethief Lake Trail intersects with the Centennial Trail; make sure you stay on the proper path. This is a lovely trail, crossing through tall grasses into timber, with great views of granite formations and peaks on the way. At about two miles in, we took the opportunity to scramble up a granite outcropping and were treated to an incredible view of the Black Elk Wilderness. 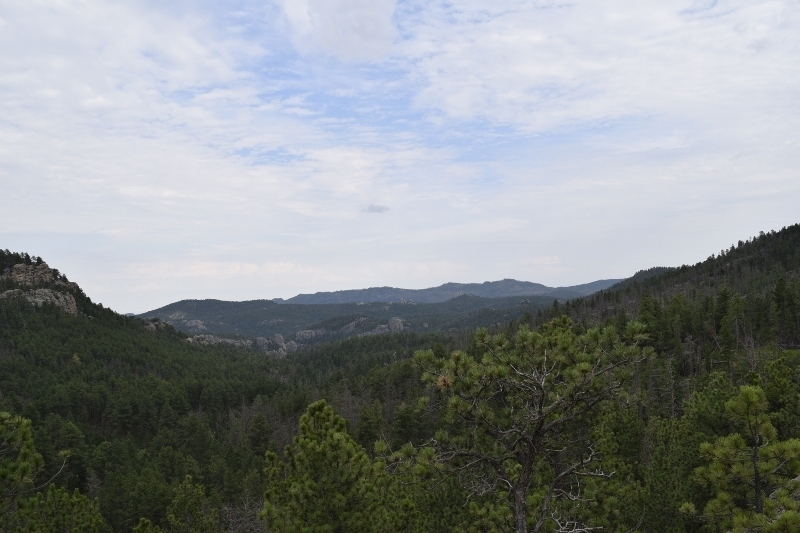 If this view of the Black Elk Wilderness doesn’t make you feel wild and free, I don’t know what will! 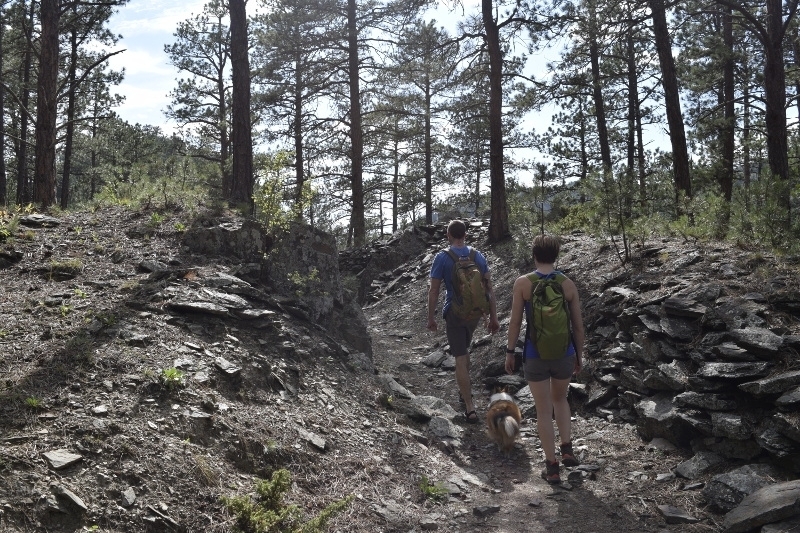 Horsethief Lake Trail is an “out and back,” meaning that you return the same way you came. After scrambling back down the granite, we headed back to the trailhead, then returned to our campsite for the night. We enjoyed a quiet evening by the campfire and hit the sack pretty early. There’s nothing like a good hike in mountain air to help you fall into a pleasant slumber. 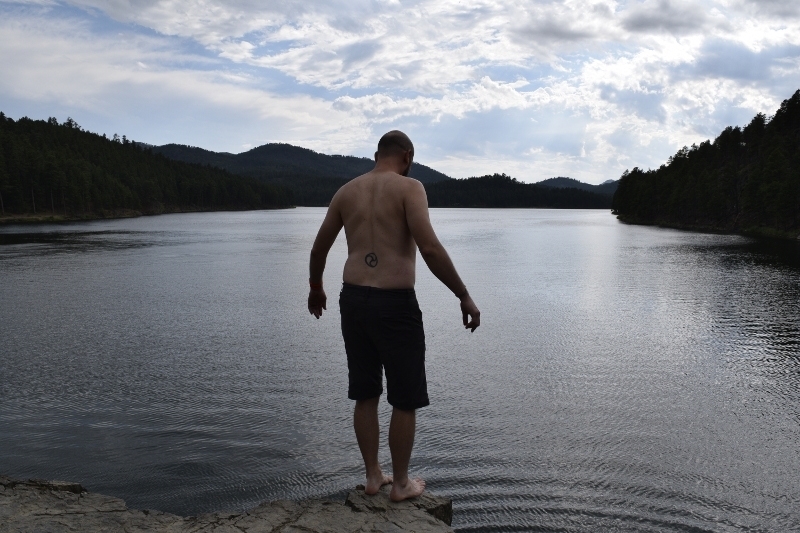 The Flume Trail to Sheridan Lake: Are You Going to Jump? 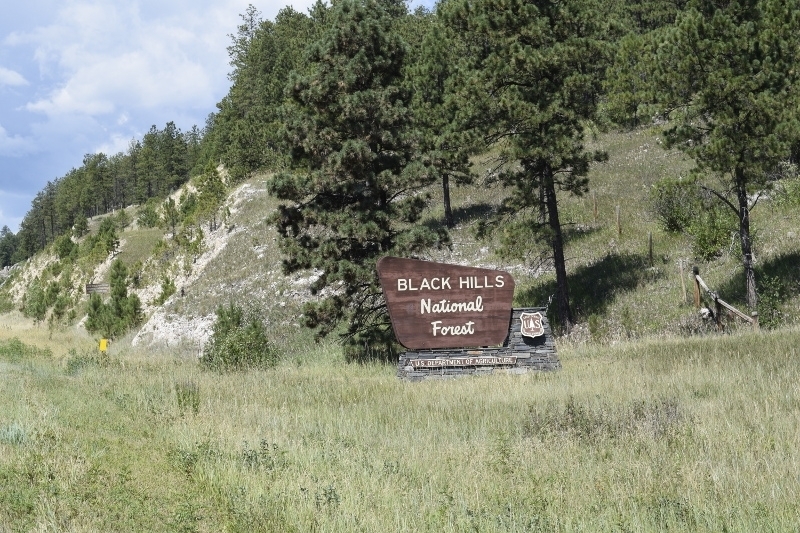 The Black Hills are chock full of hiking opportunities; like I said, you can’t drive anywhere without passing a trailhead. 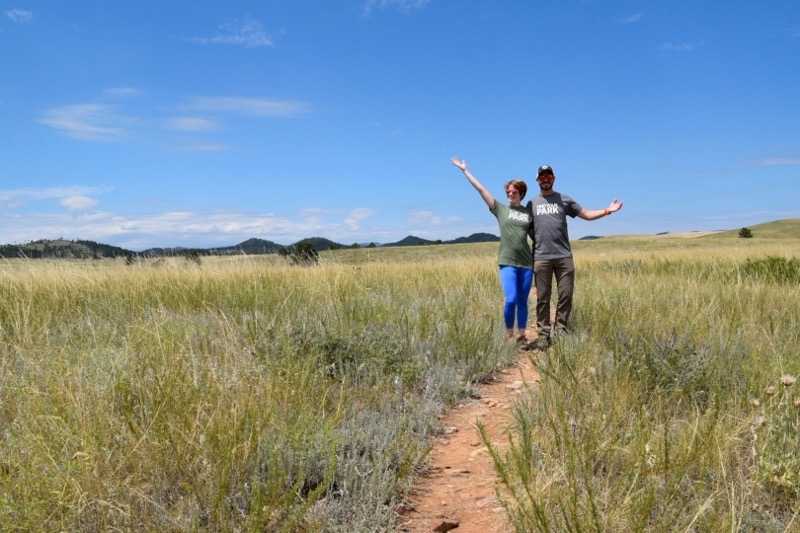 Even when we headed to Rapid City, we found nearby trails. Our friend Eric, decided to show us a few nearby spots that he thought we’d enjoy. One of which being the Flume Trail. Because of the Flume Trail’s historical significance, it has been designated a National Recreation Trail. In the early 1880s gold miners used the Rockerville Flume to move water twenty miles so that miners could extract over $20 million in gold from the area. 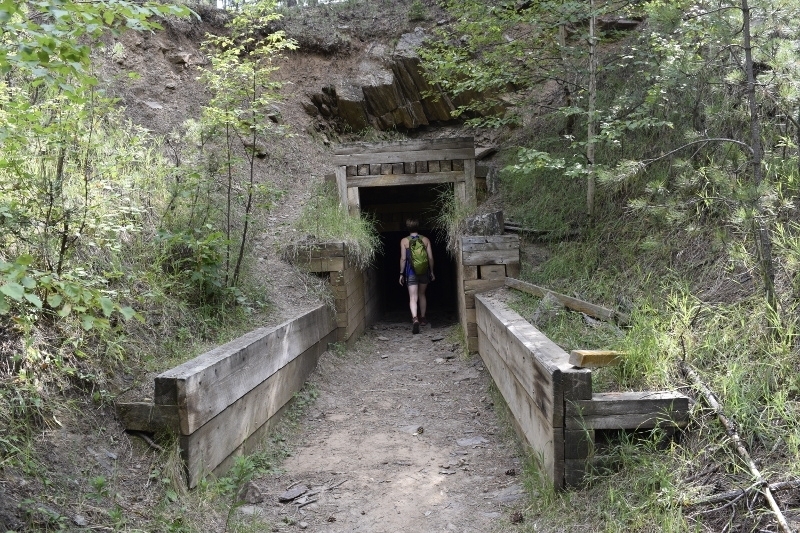 Two of the original tunnels have been incorporated into the trail (although there are ways to bypass them, if you’re claustrophobic). You may need to crouch down as you pass through; not paying enough attention, I smacked my noggin against a wooden beam, and man did it hurt! “Hell yeah.” I said resolutely. Of course, once I had my boots and shirt off, staring thirty feet down to the water gave me pause. Eric assured us that the water is plenty deep, and then calmly walked right off the edge, dropping into the water below. He surfaced, with a grin on his face, and told me the water felt great. Well, who am I to let a little fear get in the way of a good time? So I leapt. Just a moment before I take the leap! Clarissa followed, and then, just for the sake of doing it, I jumped in again. I don’t know when I’ll the next opportunity to jump off a cliff into refreshing water in the Black Hills, so I wanted to make the most of it! I should note, it’s a good idea to know how deep the water is before you jump into it. In this case, it’s eighty feet, which is a safe depth to jump into from thirty feet in the air. 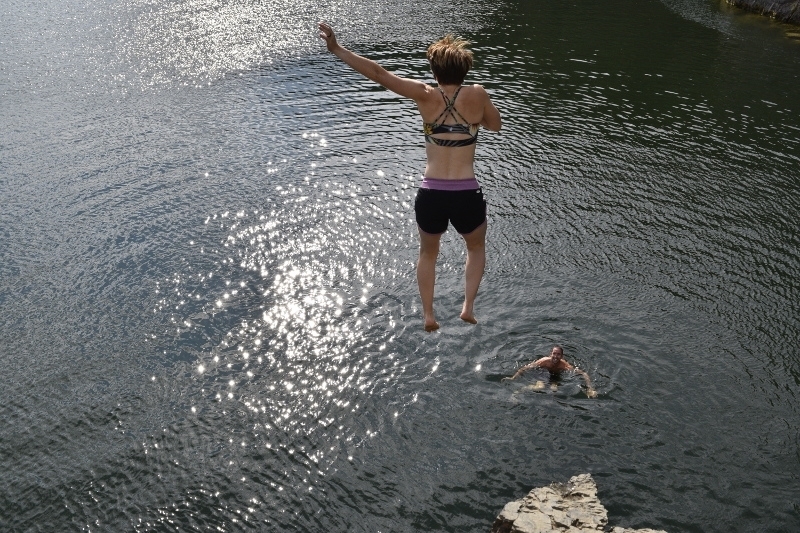 Clarissa took a flying leap into Sheridan Lake as well. Having started our trip in one National Park, it made sense to conclude with a visit to another, Wind Cave National Park. The park’s namesake, Wind Cave, is an intricate network of passages and like most caves, the climate is consistently around 55 degrees year round. The only way to see it is during one of the five different ranger-led tours. Tickets for these tours are sold first come first serve, so make sure you come early. 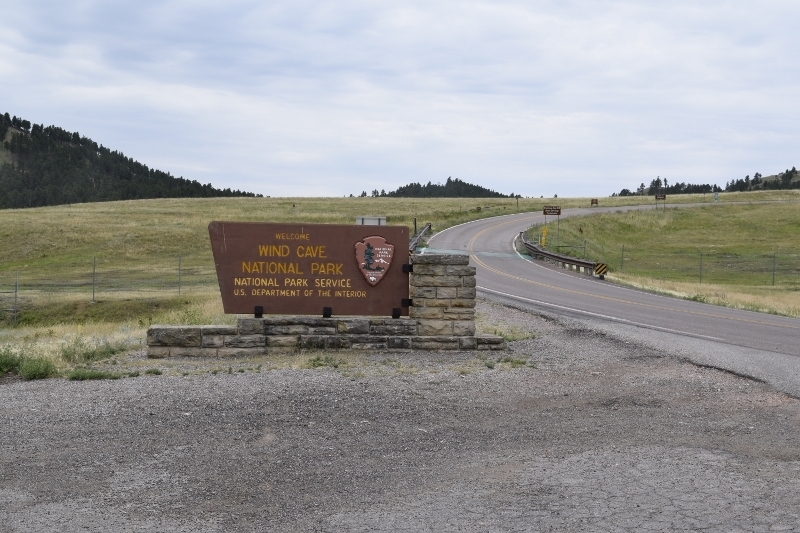 Welcome to Wind Cave National Park! Wind Cave is the sixth longest cave in the world, with 140.47 miles of explored passageway. It’s also the densest cave system in the world; it has the highest volume of passages per cubic mile of any cave system on the planet. It is literally a maze of passageways down there, so make sure to stick with your group during your tour. 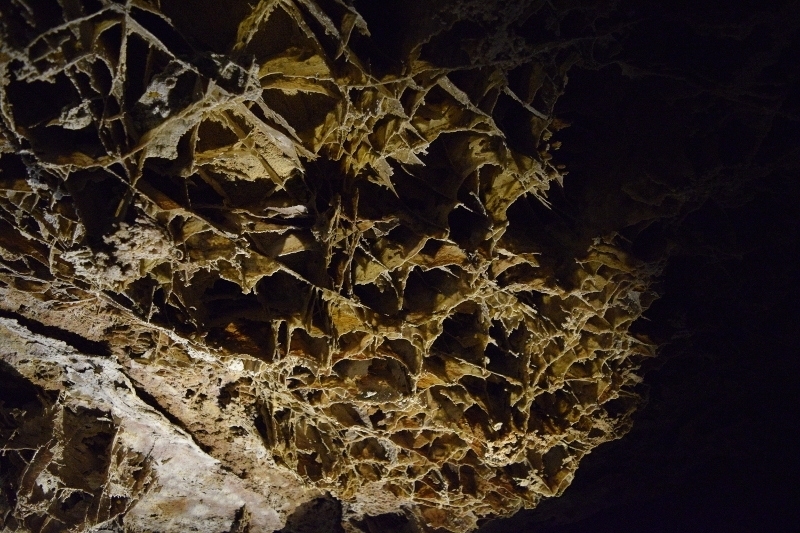 Wind Cave is also known for the presence of a large amount of a particular kind of calcite formation known as boxwork. The boxwork in Wind Cave is amazing! Boxwork is intricate and beautiful, and Wind Cave is full of it. Roughly 95 percent of the world’s known boxwork formations are located in Wind Cave! 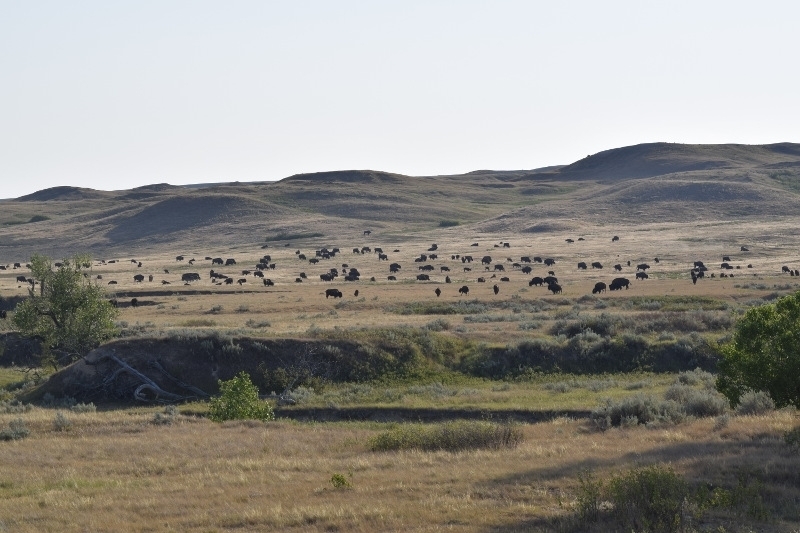 Above ground, Wind Cave National Park is home to one of the largest remaining natural mixed-grass prairies in the United States, and one of only four free roaming bison herds that are genetically pure that inhabit public lands in North America. Unfortunately, we didn’t have the time to explore the trails or camp in Wind Cave National Park on this trip, but we will definitely return, and hopefully soon. This was my first trip to Wind Cave National Park, but I plan to return and explore even more! Before Clarissa and I had even finished our third visit to the Black Hills and Badlands, we already began making plans for our fourth and fifth trips. That’s how much we love it here. As you’re seeking outdoor destinations to visit, this area should be part of your plans. There are so many things to do and see here that you’ll have absolutely no trouble finding the right adventure for you. In fact, the only problem I seem to have in the Hills is that I never have enough time to explore everything I want to! Which is why I’ll continue returning to the Black Hills and Badlands, and why I hope you’ll decide to have your own adventure in the area. I hope you’ll consider exploring the Black Hills and Badlands. It’s a perfect place for outdoor adventures! During our stay, we also enjoyed Custer State Park’s Wildlife Loop, Needles Highway, and Iron Mountain Road, all of which we would recommend. For more information about these attractions, and more, head over to the Black Hills & Badlands website. I think bison are my favorite animal and I’m so glad they are being reintroduced to more of their former grazing lands. I really like bison as well, and like you I’m glad that they’re returning to a lot of their old habitats. They’re fun to observe up close, even if they do get a little too close sometimes! I’d never heard of this are before reading your blog. Now, every time I read about it, I want to visit a little more. It looks like such a magical place. It really is quite magical, even more so when you’re out there. Any time you’d like to explore the Badlands, you just let me know, and I’ll be happy to show you everything I know!